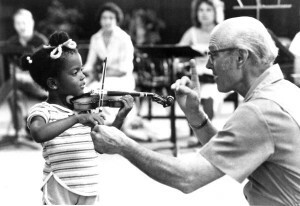 John D. Kendall, leader in bringing the Suzuki Method to the US has passed away. | LEARN TO PLAY THE VIOLIN FOR FREE! John D. Kendall, leader in bringing the Suzuki Method to the US has passed away. John D. Kendall was a leader in bringing the Suzuki Method to the United States. In 1955 he was presented with a grant to travel to Japan to meet Shinichi Suzuki and translate his ideas and teachings into a philosophy and pedagogy for violin teachers around the U.S.
An internationally acclaimed string pedagogue, Mr. Kendall has taught violin at the college level more than 50 years and is largely responsible for bringing the Suzuki Method to the United States. Mr. Kendall received his undergraduate degree from the Oberlin Conservatory of Music in 1939, and earned a master’s degree from Columbia Teacher’s College. Currently, it is estimated that more than 350,000 children are learning according to Suzuki principles on violin, viola, cello, piano, guitar, flute, recorder, harp and bass. There is a Suzuki preschool, and the body of literature for Suzuki Parent Education continues to grow. John Kendall directed the SIUE program until his retirement in 1994.
via John D. Kendall – Wikipedia, the free encyclopedia.